Of the three wild kittens I fostered she was the feisty one, not afraid to stand her ground. And a few weeks later, when the door of the Moosey office opened, she was the first to venture out and explore. 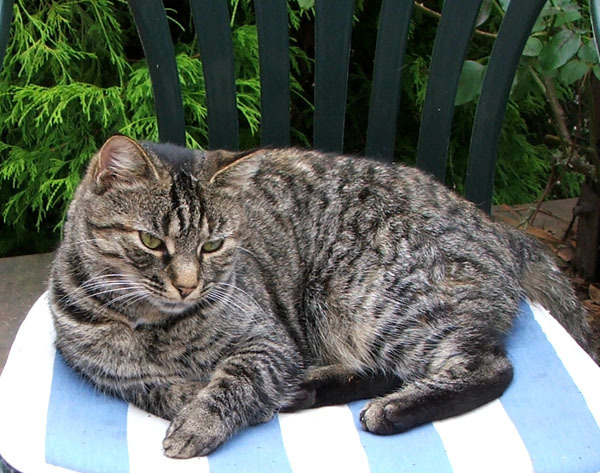 Such a brave little cat, keeping the family together, not easily seduced by fresh meat and patting fingers. Growl! Hiss! Spit! But that was then. Now Histeria has become the happiest and bounciest of the young Moosey cats, with loads of cat-sparkle and cat-personality. She's always happy and friendly, and enjoys meeting new people. She was the wildest foster kitten, and now she's the most sociable... She loves warm weather gardening, and going for country walks in the Orchard, and sitting on laps. Histeria is now a happy-cat, rather than a hissy-cat. Histeria is a mid-air leg-rubber, leaping clean off the ground for a flying smooch, connecting gracefully with the side of the gardener's knee. She loves the dog, too, though he isn't quite as easy a mid-air target - flying cats tend to make him nervous. I've learnt to stand still when I see her coming. 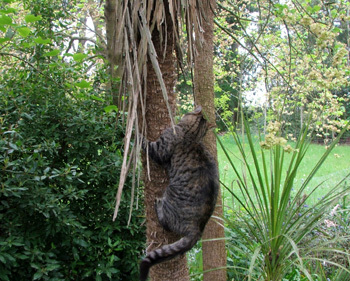 Her favourite garden trees to climb are Cordylines, or Cabbage trees. These trees have branchless trunks, with a ball of strappy leaves at the top - nowhere really for a climber to go. Hissy is very agile, though, and easily scoots down the trunk backwards. Her favourite country garden ritual is the feeding of the hens. She bounces alongside me on my daily walk to the Hen House, squeaking happily. Then she'll bounce into the fork of the Wattle tree to be patted. When cats and humans are relaxing together in the evenings Histeria has appointed herself the chief inside-of-ear-licker. Thankfully this is for cats only! It's not only brother Percy who gets the treatment - no cat is safe from her obsessive cleaning. 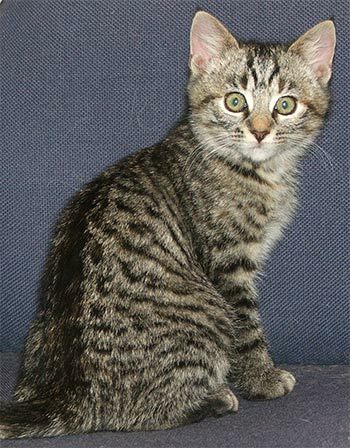 Hissy has two siblings - ginger brother Percy and grey little sister Lilli-Puss. 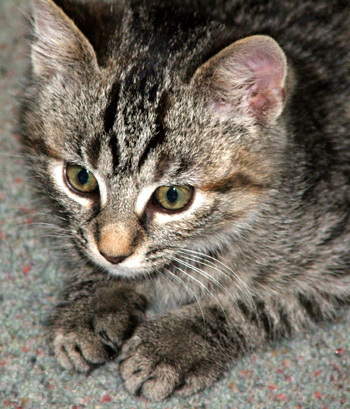 The insides of their ears are always shining clean, thanks to Histeria the Tabby - the hub of the family.